The individual points that are recorded on the British Columbia Fly Fishing League's leader board will consist of the competition points that a competitor has earned at individual competitions throughout the competition season, which starts on January 1st and ends on November 15, 2018 The results of the season will be finalized after that date, and medals and trophies will be presented at an awards ceremony and banquet that will be held on the last weekend of November 2018. 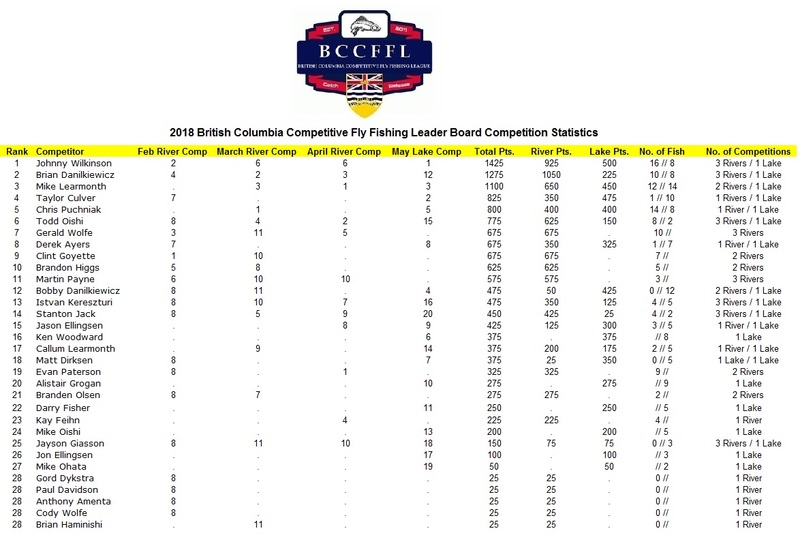 Competitors are free to compete in as many competitions as they're able to attend, but their total points on the leader board are calculated based on their 3 best finishes at the river competitions (maximum of 2400 points) and their 3 best finishes at the stillwater competitions (maximum of 2400 points) that are held within the province of British Columbia. 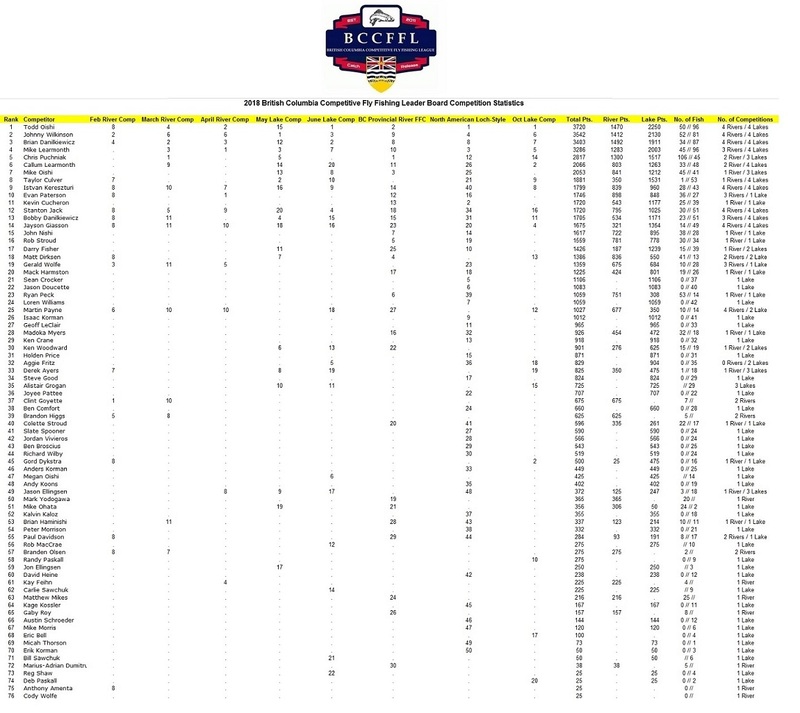 A competitor's results from 3 day competitions with both river and stillwater sessions will be added to their total points (maximum of 2400 points) in a separate category. This system will allow competitors the opportunity to improve their individual standing by culling poor performances at past competitions, and replacing them with better performances. 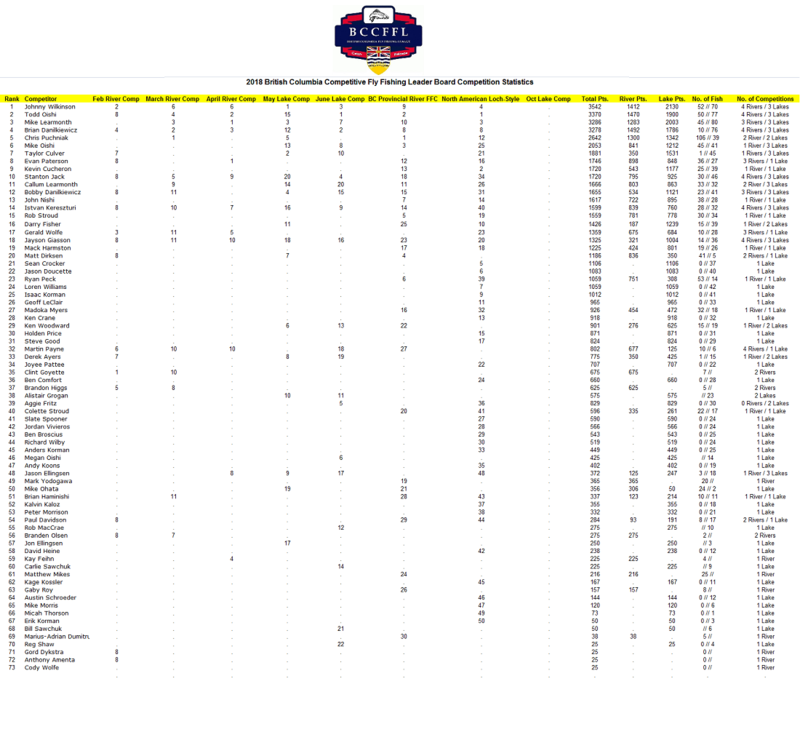 At the end of the competition season all competitors will start out the new season with zero points on the leader board. 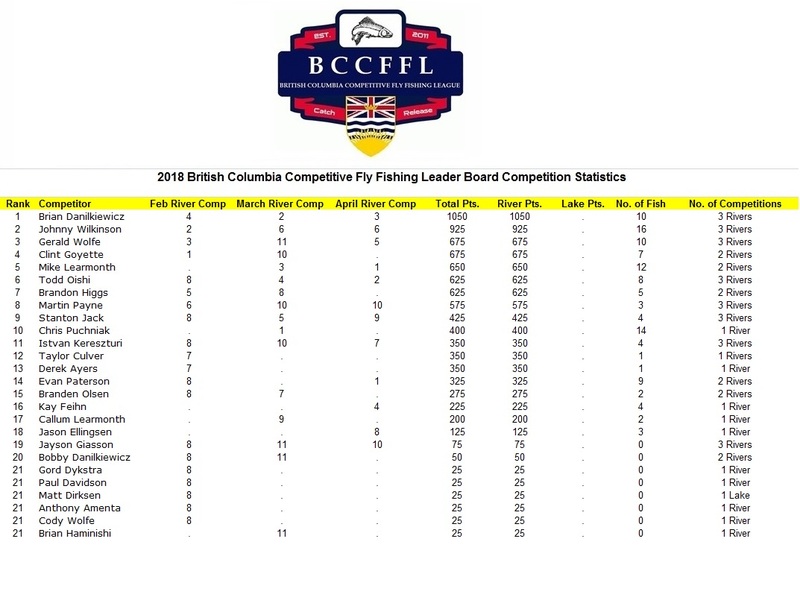 • The British Columbia Fly Fishing League's leader board includes the results from all fly fishing competitions and championships that comply with FIPS-Mouche rules and are held within British Columbia during the competition season. 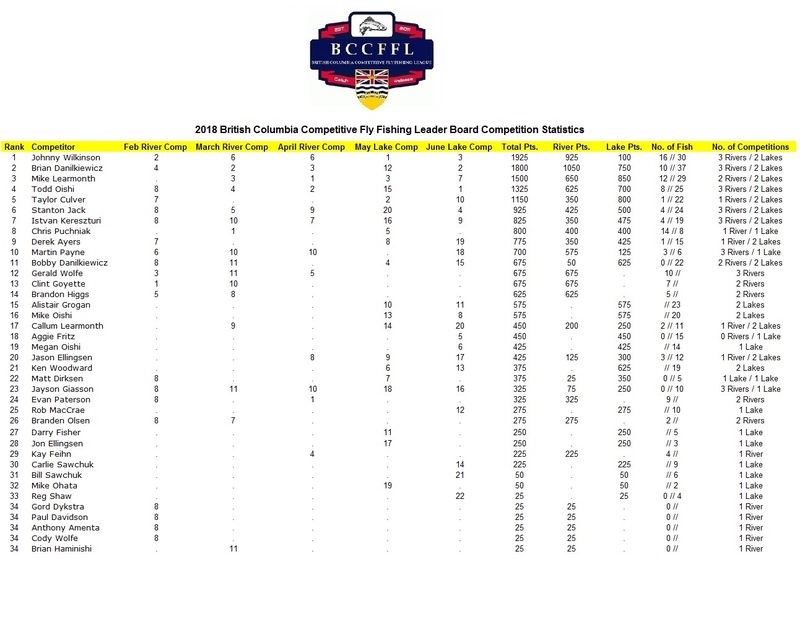 • All competitions seeking sanctioning and inclusion on the Leader Board must be submitted to the board members at least 30 days prior to the date of the event and must be open to all league members. • Competitors are encouraged to organize competitions in their region, as there are no limits to the number of competitions that can be held within a season. • The opening date for registration for each event must be announced on this forum at least 7 days prior to registrations being accepted. • Registration must be accepted on a first come, first served basis, with organizer(s) being guaranteed a spot(s) at that competition (maximum of 2 spots can be reserved for event organizers). The point system that is used provides a "tighter gap" between the positions that the competitors score, which will guarantee that no one is untouchable after just a single top performance, and thus, will encourage greater participation by those that wish to advance and those that are defending their lead on the Leader Board, which will ultimately generate a higher level of excitement and activity amongst the members of the League and encourage newcomers to our sport. The new point system for 2016 and onwards will make it a whole lot simpler and require less effort for competitors to calculate their points and understand what's required in order to advance on the Leader Board. The point gaps remain constant regardless of the number of competitors in attendance. The last place person will always be awarded the same amount of points, which are based on the number of days of the competitions: 25 points at a single day competition; 38 points at a 2 day competition; and 50 points at a 3 day competition. The maximum points awarded for 1st place for 1 day mini-competitions with less than 12 competitors will be based on the number of competitors X 25 points. For example: 10 competitors X 25 points = 250 points for first place and the point scale. Calculating the points is a very simple process with this formula - with little more effort being required than just a quick glance at the charts or doing your own math. 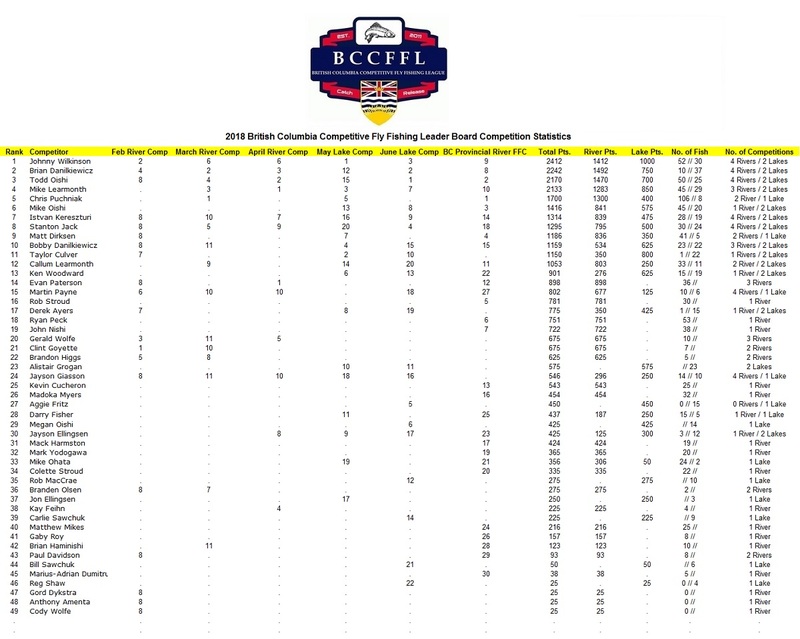 The Maximum points awarded for a 1st place finish remain constant, but the Point Gap at all competitions with more than 24 competitors decreases (tightens) based on the number of competitors competing at those competitions. Step 1: 1200 (point scale for 1st place) - 50 (no. of competitors) = 1150. Practice Practice Practice,,,,, so happy and proud to fish with the best anglers and be apart of this group,I've learned a lot over the past year and really couldn't have done it without the help of the dank boys Brian for hard knock teaching and Bobby for keeping it cool thanks guys, great bunch of guys we've got here,, can't wait till next year,, fish on!! !